Yet again, my inbox and social media provided me with inspiration for my column. 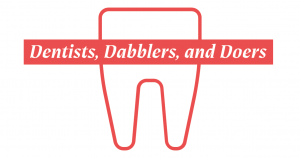 At the end of December, I was agonizing over finding a topic when the daily “Seth’s Blog” email appeared with the headline “Nobody dabbles at dentistry.” Of course, with an intriguing lead like that, I had to read the post and found his blog post touched on some of the things I’ve been pondering this fall. In this blog post, Seth points out that, “There are some jobs that are only done by accredited professionals.” As someone who had dental work done in her teens by someone who wasn’t really qualified to do that work (something I discovered much later in life), I’m in full support of the American Dental Association and the credentialing and continuing education it provides for dentists. By education, I’m an engineer, but I’m pretty sure no one would want to enter a structure I’d built since those skills are long dormant, except for when used to build ramps to get motorcycles in and out of trucks and construct Lego towers with my daughter. I took the Engineer-in-Training (EIT) exam, but I didn’t move forward in the profession and complete the additional steps required to become a Professional Engineer (PE). Something you would think, after twenty-five years, some engineering organizations would figure out and stop sending mail addressed to me as an engineer at my parents’ house. By education and experience, I’m a librarian. Or at least that’s what I tell people in elevators. While I may not use the library knowledge and skills I’ve gained while working in a library at this time, I spend most of my days thinking about library-related tasks and challenges as I work with our members. And I’m still the person my friends call when they’re trying to research something and can’t find the answer. This isn’t a new discussion. As a profession, librarians have been trying to demonstrate their value for years. Specifically, in theological schools, institutions are considering what a library looks like while online distance education is “growing rapidly, pushing the boundaries of who typically attends theological school” as reported in the August 2017 Auburn Studies report (NOT) Being There: Online Distance Education in Theological Schools. Administrators contemplate how, and if, to fill open positions and what is required of applicants when theological librarians retire. Faculty members ponder if there is time for information literacy instruction while the number of credit hours required decreases for an MDiv. At meetings of the ATLA Professional Development Committee (PDC) this fall, we’ve had some engaging discussions around the types of skills and knowledge our members need to develop to thrive in theological libraries today. We’ve spent time looking at the Organizational Ends and talking about competencies for theological librarians, developing toolkits and other resources that members can use asynchronously, and increasing the number of professional development and leadership offerings. Much more to come on all those things throughout the year. Seth says the way to distinguish yourself in a non-dentist job “is to be extraordinarily good at it.” We may not be dentists or engineers, but as librarians, we possess a unique skill set, and we’re pretty good at what we do. I was reminded of this when a few days ago a dear friend posted to my Facebook feed a tweet from Jon Klassen (an author/illustrator whose book This is Not My Hat is one of my daughter’s favorites). last year in a library in Alaska I read a folk tale in a random book on a random shelf & have been thinking about it since & today i wrote the librarian w/ no book title or author & in 2 hrs i had a scan of the story & cover in my inbox – librarians should be running everything. By passion, I’m a marketer. You don’t have to be an accredited professional to be do marketing. It’s something in which a lot of folks, including me, dabble. So, I read things by extraordinary marketers, like Seth Godin’s recent book This is Marketing: You Can’t Be Seen Until You Learn to See. As a marketer who is also a librarian, I’m driven to help our members create relationships and delight their “customers” (students, scholars, faculty, and administrators) with their unique skills and knowledge. After all, we are Librarian(s): The Original Search Engine.